I’m loving all these bootlegs these days. I’m also loving the grittiness of the Dead Weather album. 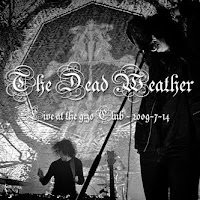 So why not throw up a Dead Weather bootleg? Great idea Ronan! This one is taken from the 9:30 Club in Washington DC on the 14th of July this year. It’s a great show, and really highlights the new band of Jack White and Allison Mosshart in full flight, moreso than the album does. Watch: The Dead Weather – Will There Be Enough Water?